What Exactly Happens At Laughter Yoga Sessions? Laughter Yoga Sessions are led by a Laughter Leader or Teacher, who controls the Laughter Session, explains and gives commands to start and complete different Laughter Exercises. The Leader guides the members to start and complete the Laughter Exercises together for improved group dynamic. 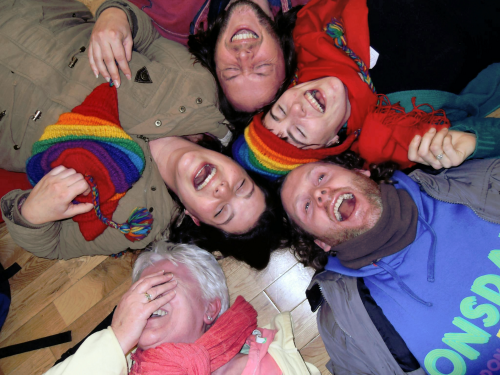 During most Laughter Yoga Exercises, group members keep moving, and establish eye contact with others in the group. 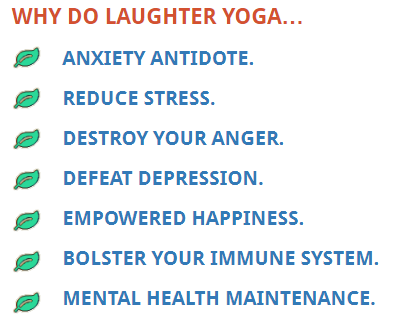 Most Laughter Yoga Sessions focus on enjoyment, rather than force, when doing Laughter Exercises. 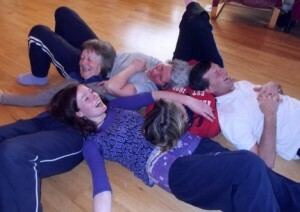 The Laughter Yoga Session strives to cultivate childlike playfulness during Laughter Yoga Exercises. Clap hands parallel to each other for full finger-to-finger and palm-to-palm contact, thus stimulating Acupressure points in our hands to increase energy levels. Rhythm is added to the clapping, to further increase energy levels and group synchronicity, often a 1-2, 1-2-3 rhythm. Movement is then added. There are many variations, but most move hands up and down and swing from side to side, with corresponding movements of the hands and feet. A simple chant is added to the clapping, normally HO, HO, HA-HA-HA. These are heavy exhalations that come from the belly, to stimulate diaphragmatic breathing. Adding dance movements boosts feelings of happiness and joy. Enthusiastic clapping, chanting and movement, help build positive energy, gets the diaphragm moving, and creates a positive group dynamics in preparation for Laughter. Gibberish is a language of sounds without meaning. Children speak gibberish when learning to speak and during play. Gibberish may be used as a Warm up Exercise in Laughter Yoga, to help people to loosen up and reduce inhibitions and shyness. Laughter Exercises are interspersed with Deep Breathing Exercises to help flush the lungs, and also bring physical and mental relaxation. One of the objectives of Laughter Yoga is to cultivate Childlike Playfulness that helps us to Laugh Without Reason. A happy chant to use after a Laughter Exercise: VERY GOOD (Clap Forward), VERY GOOD (Clap Forward), YAAAAAAY (Swinging arms up into a Y shape with thumbs up in childish exuberance and exhilaration). Some groups incorporate light Physical Exercises between bouts of Laughter, especially when Laughter Clubs meet in the morning for Seniors and special groups. The Physical Exercises chosen may promote mobility through Stretching, ease Cervical Spondylosis, Neck Stiffness and Frozen Shoulder, and other common complaints of Seniors. Some Laughter Yoga groups perform Laughter Exercises in a more energetic way and develop high energy exercises (like power Yoga). This can be invigorating with very high levels of energy being generated. 1. Yoga-based – Derived from Yoga postures. 2. Playful Exercises – Playful Exercises help to reduce inhibitions and shyness, and convert simulated Laughter into unconditional Laughter. They often include method-acting techniques to shift our mindset, imagining and acting out a situation or a role. One-meter Laughter, Milkshake Laughter, Mobile Phone Laughter and Hot-Soup Laughter are especially popular. 3. Value-Based Laughter Exercises – These Laughter Exercises are designed to ‘program’ positive feelings to gestures, or situations while laughing, teaching our subconscious new auto-responses. Visa Card Laughter, Appreciation Laughter, Greeting Laughter, and Forgiveness Laughter are popular. Laughter Yoga Exercises are sometimes followed by Laughter Meditation. As you do Laughter Meditation, Laughter may flow like water from a fountain — a more spontaneous and deeper experience than that achieved through Laughter Yoga Exercises. Sit comfortably in an inward facing group so people can see each other and make eye contact, not too spread out. Nobody should talk or try to communicate in any way with others (no eye messages, funny faces, and funny sounds), as this will engage the conscious mind — the conscious mind must be disengaged. Sit in silence with eyes closed, keeping an awareness of your breathing. After silence, open your eyes and sit in a relaxed position (not a Yoga posture). Initiate by simulating Laughter in a slow and gradual manner as in Gradient Laughter. Soon one person begins genuine Laughter and others follow. If not, we may alternate periods of quiet with Pranayaama exercises to stimulate the diaphragm until Natural Laughter begins to break out, at which time we normally lie down and let the Laughter flow. It is not unusual for people to undergo strong cathartic moments during Laughter Meditation. This is positive as they are release powerful emotions and emotional problems that may have been pent up or many years. Laughter may be interspersed with tears and even anger, as emotions surface, and are released in wonderful non-violent catharsis. Should this occur, allow it – do not comfort that person. The Laughter Leader will gently bring people out of Meditation back to silence, with a focus on their breathing. Laughter will continue to bubble up but the Laughter Leader will take steps to settle the group, before leading Guided Relaxation. The extent of the Relaxation will depend on the group, Session intensity, the time of day and other factors. During Laughter Yoga, Exercises stimulate blood circulation, raising the blood pressure for a period before it comes back below the base level. The muscles contract during a Laughter Session before they come back to their Relaxation Mode. Consequently, the real benefits of Laughter Yoga do not occur during the stimulation phase, but become apparent after the Laughter Session, during relaxation. During 12 years of Laughter Yoga experience, we have found that some people complain that although they laughed heartily during the Session, especially during Laughter Meditation, they were left feeling emotionally unstable and ‘empty’ afterward. Laughter is a powerful dynamic energy that can open your sub-conscious mind and release pent-up feelings and emotions. After intense Laughter Yoga Sessions, some people become sad and start crying, while others experience bouts of anger, irritability and other negative emotions. For that reason, it is important to do Grounding Exercises after a Laughter Yoga Session to normalize our systems, and allow Relaxation Techniques to ground the energy of Laughter. After Laughter Meditation, energy levels can be too high to return directly to normal. To reduce these levels the leader may talk the group through Guided Relaxation, also called ‘YOGA NIDRA’, or Yogic Sleep. This guided body tour brings immense Relaxation by bringing complete awareness to different parts of the body as guided by the Laughter Leader. There is no fixed route or sequence. With eyes closed, take a long breath in and hum it out, actually saying the word “Hummm…” with upper and lower lips just touching each other. Vibrations are felt throughout the facial muscles, sinuses and, eventually in the head. This Exercise is also beneficial for those with Chronic Sinusitis and Nasal blockage, because humming vibrations help to dislodge mucus and also increase blood circulation. Humming has a powerful impact on the Autonomic Nervous System, and can activate the parasympathetic system that is responsible for Relaxation. This Exercise is most effective when done in a group. It is better to hum at the same time under the instructions of the leader. Humming together creates a unique resonance which is very calming. Different people have different breathing capacities; some people can hum longer than others. When leading Group Humming, ask participants to hum for as long as they can, then inhale and repeat. Ten minutes of Humming is recommended for Grounding. Dancing is also a good form of Grounding. Participants should move their hands as if pushing the air forward, while doing Ho Ho twice, then push their hands towards the ground, while bending the knees slightly saying Ha Ha twice, moving around and dancing.